This morning, an unidentified man who had an earphone on got crushed by a passenger train in Cappa area of Oshodi, Lagos state. According to a correspondent of News Agency of Nigeria (NAN) who was on-board the train, the man was standing on the rail track oblivious of the fast approaching train before he got crushed. 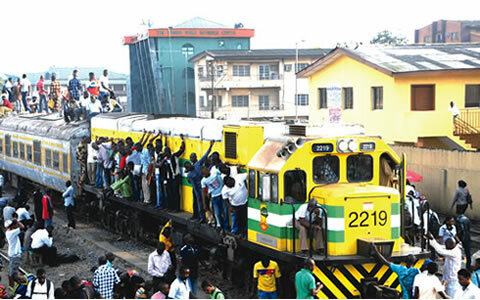 It was reported that the train (an Ogun-Lagos-bound mass transit) had blared its horn repeatedly as it approached the railway crossing at Ilupeju Bye-pass area before the accident occurred. According to an eyewitness reports, the man who had his earphone on was apparently carried away with either the call he was receiving or listening to music. “Immediately he was hit, the body was mangled as the train dragged it underneath”, the eyewitness said. One of the passengers said that, “The man has suddenly and unwittingly lost his life to sheer carelessness”.